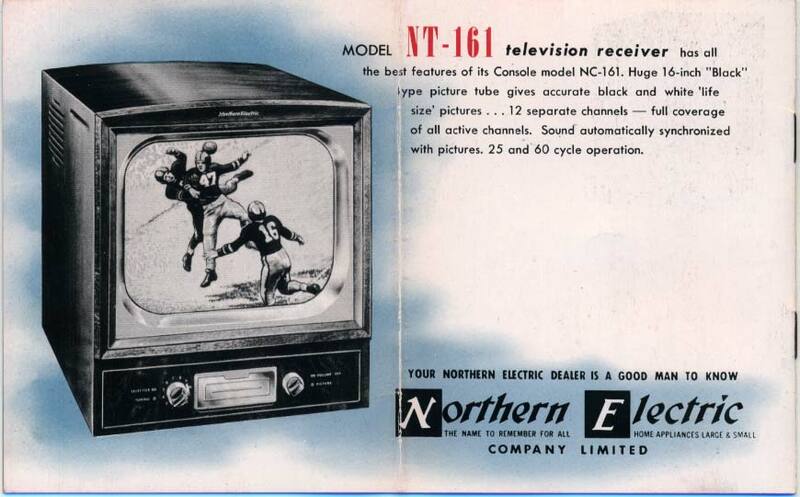 Northern Electric Sale brochure ca. 1950 (? 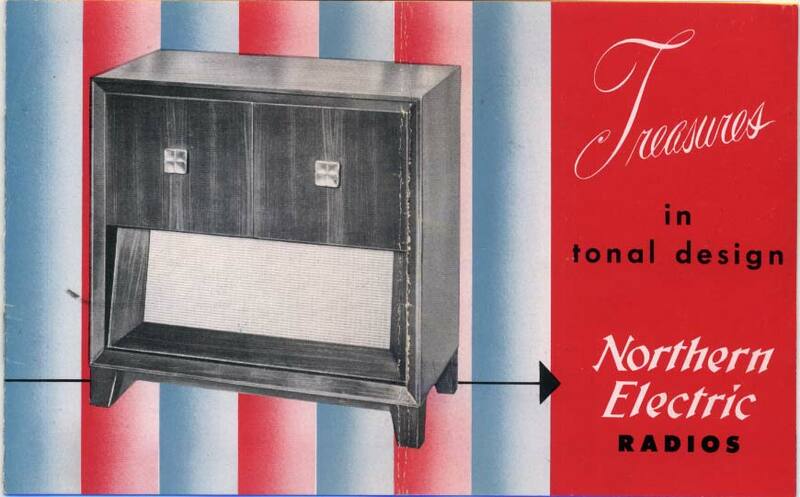 ), for radios, radio-phonographs, and televisions. 20.1 cm wide (each page) by 12.7 cm high. Clicking a thumbnail will open a new browser window with a 72 d.p.i. image scaled up 150% of the original size. Designed to please the ear! Because a radio is essentially a musical instrument we placed the emphasis on tonal quality in designing all models. Styled to please the eye! Since a radio is also a part of the room furnishings, we styled each set with beauty of line, form and colour. 'tonal designed' for every room in the home. Combination super six-tube Radio Receiver and newest tri-o-matic Record Player. Dual loudspeakers with "Balanced-bass" for tonal register. Storage space for all three types of records ... long-playing 33 1/3, 45's, and standard 78 r.p.m. New acheivement in design ... requires only 18" by 32 " floor space ... doors fold back on themselves. 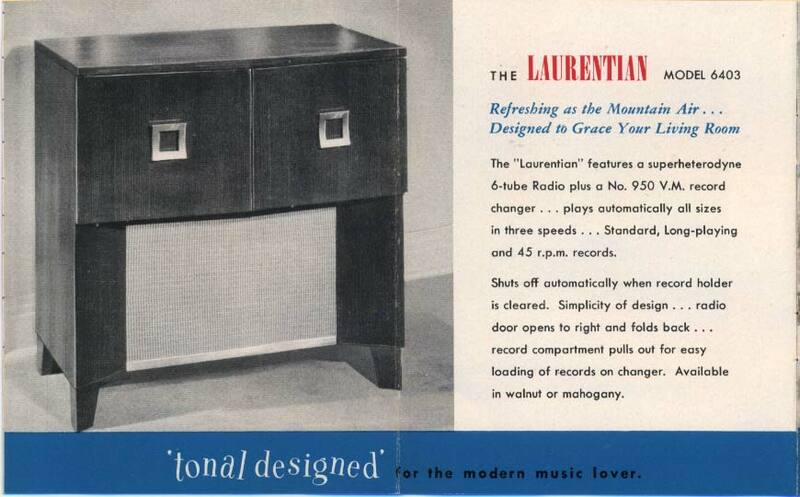 The "Laurentian" features a superheterodyne 6-tube Radio plus a No. 950 V.M. record changer ... plays automatically all sizes in three speeds ... Standard, Long-playing and 45 r.p.m. records. Shuts off automatically when record holder is cleared. Simplicity of design ... radio door opens to right and folds back ... record compartment pulls out for easy loading of records on changer. Available in walnut or mahogany. 'tonal designed' for the modern music lover. 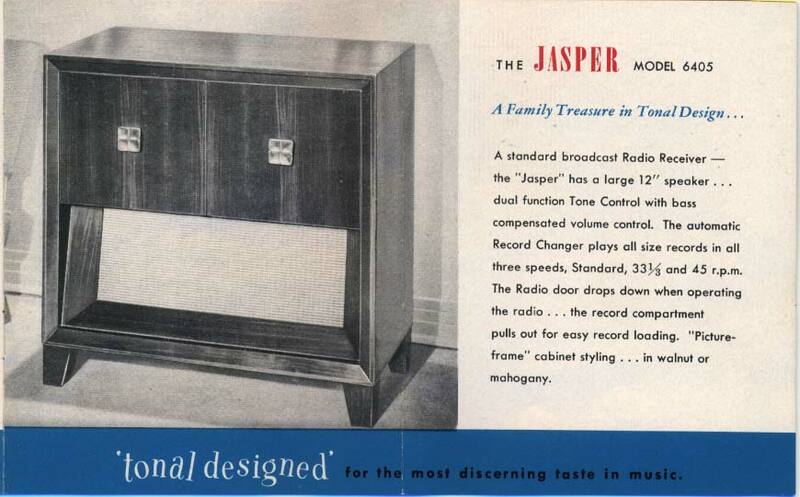 A standard broadcast Radio Receiver -- the "Jasper" has a large 12" speaker ... dual function Tone Control with bass compensated volume control. The automatic Record Changer plays all size records in all three speeds, Standard, 33 1/3 and 45 r.p.m. The radio door drops down when operating the radio ... the record compartment pulls out for easy record loading. "Picture-frame" cabinet styling ... in walnut or mahogany. 'tonal designed' for the most discerning taste in music. the Smaller Home or Modern Apartment. 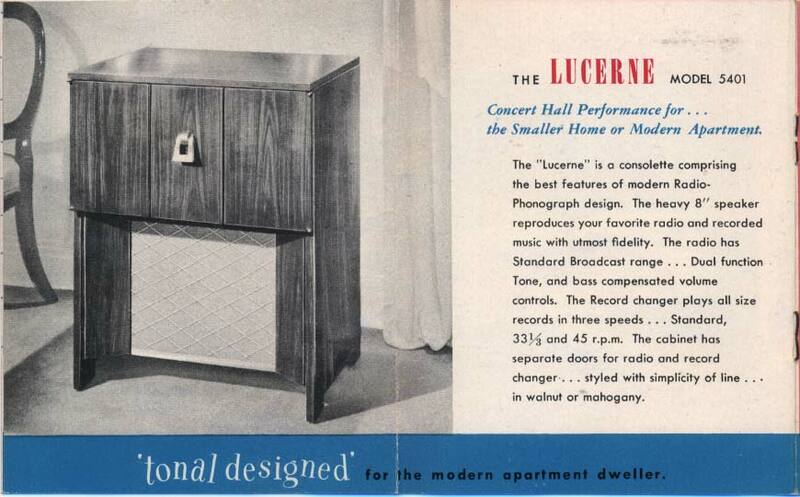 The "Lucerne" is a consolette comprising the best features of modern Radio-Phonograph design. The heavy 8" speaker reproduces your favorite radio and recorded music with utmost fidelity. The radio has Standard Broadcast range ... Dual function Tone, and bass-compensated volume controls. The Record changer plays all size records in three speeds ... Standard, 33 1/3 and 45 r.p.m. 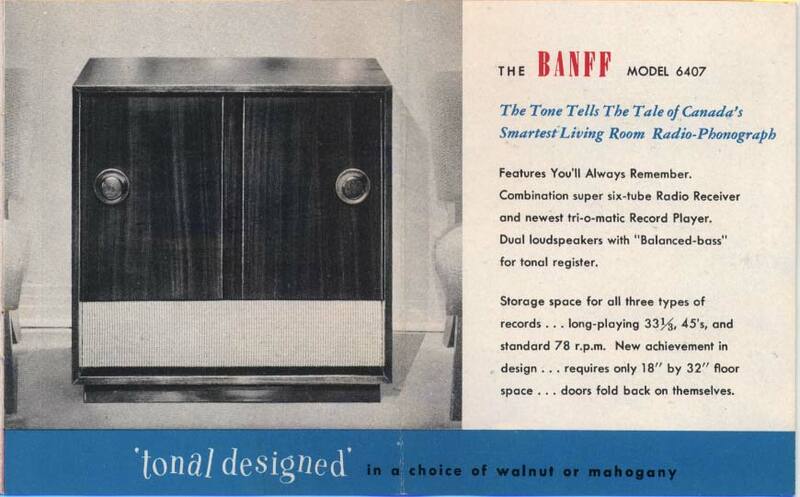 The cabinet has separate doors for radio and record changer ... styled with simplicity of line ... in walnut or mahogany. 'tonal designed' for the modern apartment dweller. 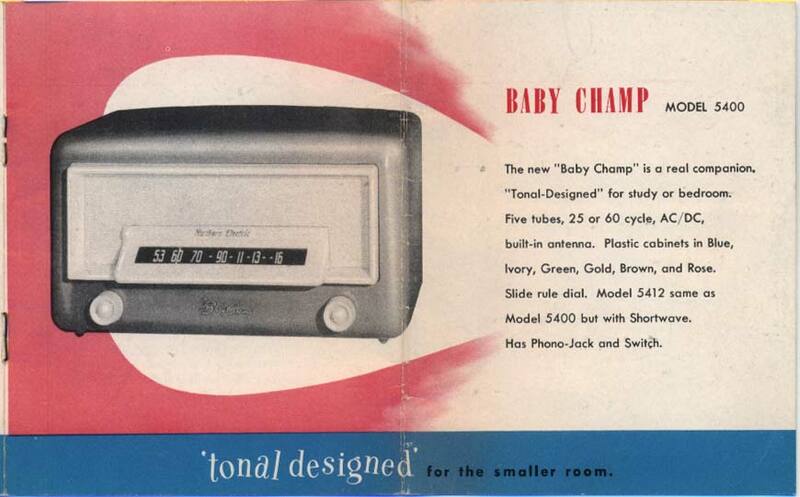 The new "Baby Champ" is a real companion. "Tonal-Designed" for study or bedroom. 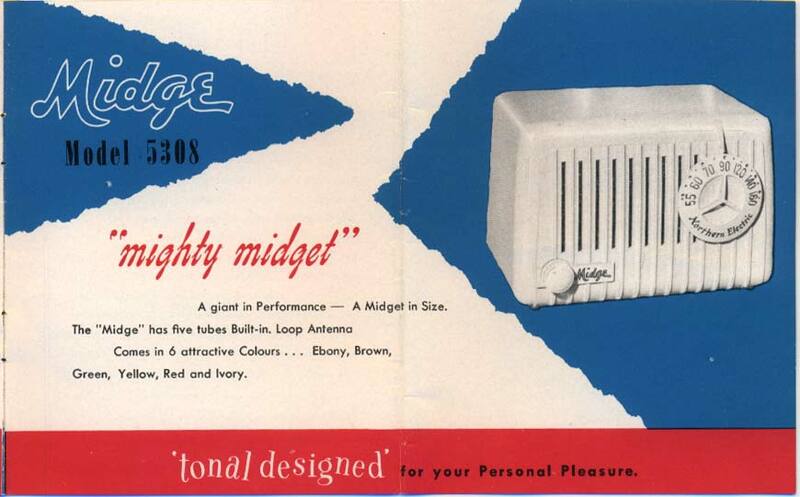 Five tubes, 25 or 60 cycle, AC/DC, built-in antenna. Plastic cabinets in Blue, Ivory, Green, Gold, Brown, and Rose. Slide rule dial. Model 5412 same as Model 5400 but with Shortwave. Has Phono-Jack and Switch. 'tonal designed' for the smaller room. Graceful in Line and Tonal Quality. A five-tube, Mantel type Radio which operates on AC or DC power source. Automatic Volume Control ... Built-in Loop Antenna. Phono Socket with Slide Switch for changing from Radio to Phonograph. Ivory or Brown Plastic Cabinet. For the Bedroom, Den or Kitchen. Operates on AC or DC power circuit. 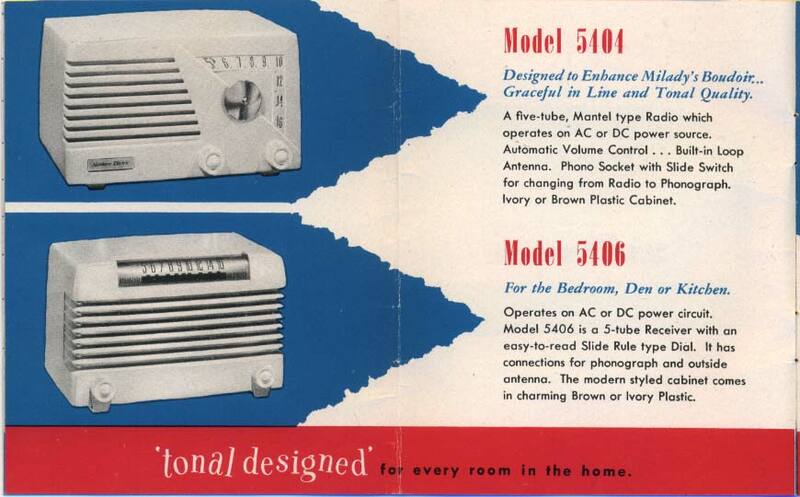 Model 5406 is a 5-tube Receiver with an easy-to-read Slide Rule type Dial. It has connections for phonograph and outside antenna. The modern styled cabinet comes in charming Brown or Ivory Plastic. A giant in Performance -- A Midget in Size. Comes in 6 attractive Colours ... Ebony, Brown, Green, Yellow, Red and Ivory. 'tonal designed' for your Personal Pleasure. This big Console Television Receiver is regally housed in an 18th Century cabinet design of selected walnut veneers. The huge -- 16 inch -- rectangular "black" picture tube, brings you 'big as life' reproduction of your favorite stars. The 12-inch Dynapower speaker is synchronized with the pictures ... you tune for the best picture and the sound is automatically correct. It has 19 tubes besides the mammoth picture tube ... pictures are automatically locked in synchronization and constant level of brightness is maintained. 25 and 60 cycle operation. 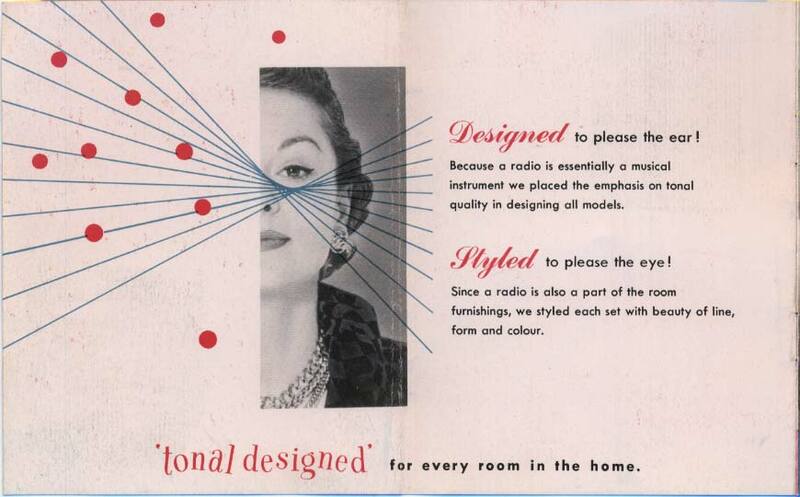 TV - Designed to Please the Eye and Ear! 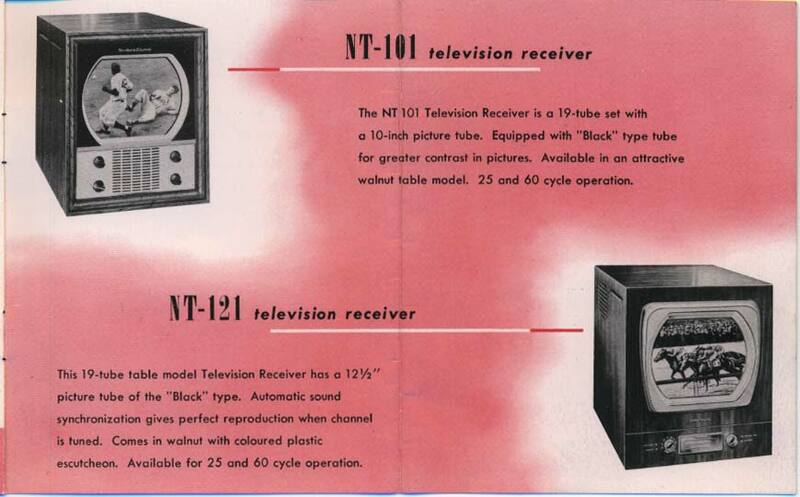 The NT 101 Television Receiver is a 19-tube set with a 10-inch picture tube. Equipped with "Black" type tube for greater contrast in pictures. Available in an attractive walnut table model. 25 and 60 cycle operation. 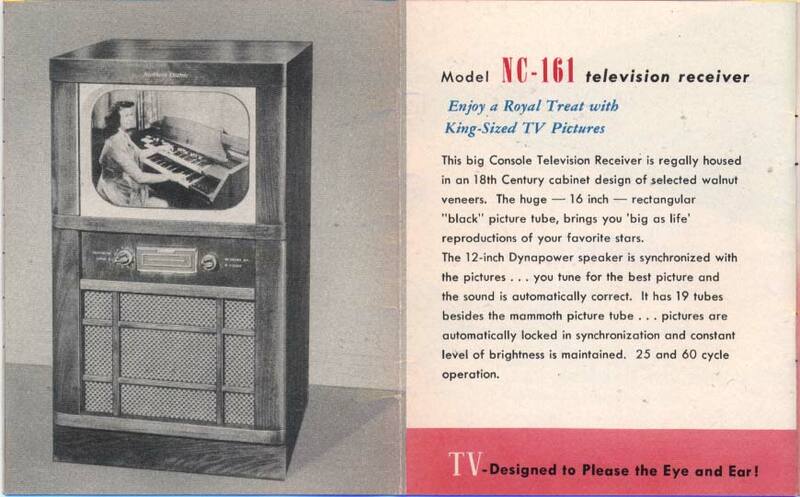 This 19-tube table model Television Receiver has a 12 1/2" picture tube of the "Black" type. Automatic sound synchronization gives perfect reproduction when channel is tuned. Comes in walnut with coloured plastic escutcheon. Available for 25 and 60 cycle operation. MODEL NT-161 television receiver has all the best features of its Console model NC-161. Huge 16-inch "Black" type picture tube gives accurate black and white 'life size' pictures ... 12 separate channels  full coverage of all active channels. Sound automatically synchronized with pictures. 25 and 60 cycle operation.